The passion that Bob and Peter Farrelly have for The Three Stooges is undeniable. For the past decade they’ve gone through many possible incarnations of this update in order to give the iconic trio their due respect. The duo deserve applause for their commitment to bring the Stooges to a 21st Century audience, who may not be as familiar with Moe, Curly, and Larry. But it is unfortunate this love letter of a final product does not match their dedication. 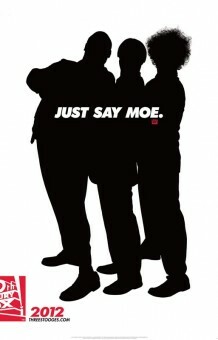 Broken into three stories, working independently but structurally tied together, we get the same old Moe (Chris Diamantopoulos), Curly (Will Sasso), and Larry (Sean Hayes), lovable and violent goofballs. Even at a young age which we see them at, they fit everything we know about the characters. These are not actors making impersonations, but embodiments, with perfect casting on the Farrelly’s part. Growing up as orphans and best buds, the three of them take up the task to save the orphanage, meaning they have to raise $830,000 dollars. To do so, they’ll “wirk” as much as they have to. The set-up the Farrellys give for The Three Stooges is ripe with comic possibilities, some of which they deliver on, but they lack one important detail to make it all work: the payoff. The third story is where The Three Stooges falls apart, and it’s a big tonal, structural, and comic miscalculation, never coming close to the silly charm of the previous two stories. But the first two-thirds make for a fairly enjoyable experience, as watching the Stooges cause innocent havoc is a good deal of fun. In the vein of many Farrelly brothers’ lovable protagonists, they’re earnest and good-natured people who happen to cause chaos. They’re characters who love each other and have no quibble beating the hell out of one another. Witnessing their friendship play out and the hijinks they’re a part of, in the first two stories, are pure slapstick joy. But then the third story comes around and forgets the initial spirit the Farrellys started off with. Not only does Moe get separated from the group, but there’s also a flat subplot involving the dreadful Jersey Shore and more of Sofia Vergara‘s villain, an actress who simply does not fit the tone the Farrellys are going for. To make matters worse, the Modern Family star has to act opposite of Craig Bierko, who, on the other hand, knows what film he’s in. What’s most baffling about the inclusion of more Vergara and the Jersey Shore cast is that the film starts off with a slew of actors any sane person would prefer to watch, most notably Larry David as grumpy nun and Jane Lynch as Mother Superior. Their decision to let the Jersey Shore cast, a group who is as far away from the comedy realm as one could get, have bigger roles in third story over David and Lynch, actors with effortless comic timing, is downright bizarre. Despite the juvenile joy in the first two acts, throughout this third story one keeps finding themselves questioning the decisions made by the filmmakers. It’s a frustrating experience, especially knowing what came before was defying the horrid expectations, based purely on the marketing. With their sensibilities, the Farrellys are the perfect directors for The Three Stooges, but they did not create the perfect material for it. The Three Stooges is now in wide release.